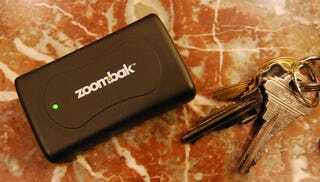 The Gadget: Startup Zoombak is offering two new GPS-enabled trackers that use GSM cellular networks to report their whereabouts. One is for pets, intended to be worn in a nylon pouch on the collar of your dog (or large cat?). The other is for cars, so you can keep tabs on your teenager, at least until they wonder what the device with the blinky green light is doing. The Price: The Zoombak for pets is a steep $200, with water-resistant pouch; the one for cars costs $250, because of the installation kit. On top of that, there's a service charge of $10 per month—looking at the price, there's no forgetting that this device is, essentially, a little cellphone. The messages didn't start coming right when he crossed the invisible threshold, but the data seemed to be timely: throughout the day I periodically got new updates as to his whereabouts. At one point, when my father-in-law was sitting not far away, I got a text that he was at some address I didn't recognize. Then I looked at the map and realized it was, indeed, the closest intersection to my house, even though it was just through a patch of woods, and outside our development. If I were really looking for him, he probably wouldn't have been hard to find.